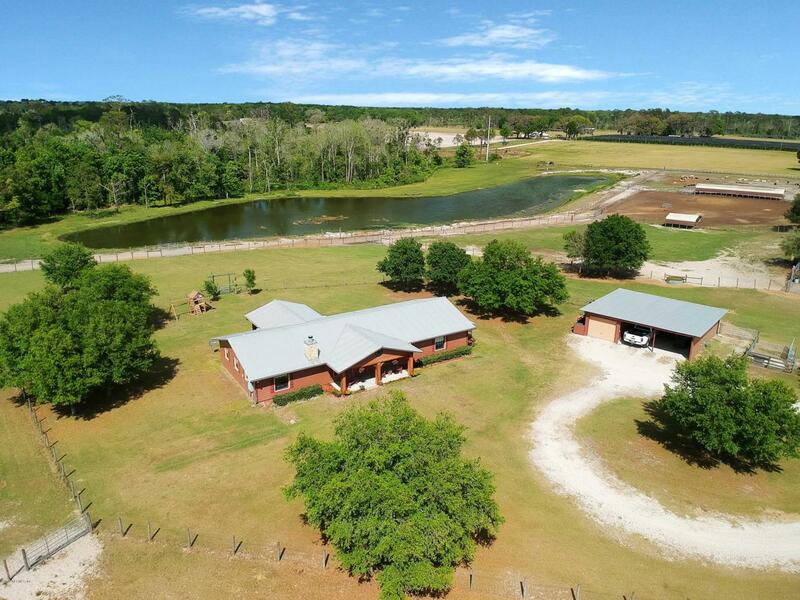 Lots of options with this incredible 34-acre horse and cattle ranch. One of a kind find, totally set up for a training facility. The single level main house is made of cement hardy board siding on top of concrete block with a metal roof. With 2368 square feet of living space, this spacious open floor plan features 3 bedrooms and 2.5 baths, bonus room, office space, laundry room, stone fireplace, picture windows, cedar mantle and trim. Additionally, this home boasts vaulted ceilings, laminate and tile flooring and stainless steel appliances. Serenity awaits on your front porch as you watch the horses and cattle. Enjoy a relaxing view of your private pond stocked with catfish, tilapia, bass and brim off the rear lanai.Three covered parking spaces and 3 stalls are located next to the main house. The 864 square foot Guest House features 2 bedrooms and 1.5 baths, a full kitchen also featuring stainless steel appliances and space for a stackable washer/dryer and generator inputs for the main house, barn and well. For the horse enthusiast, this estate boasts a total of 30 stalls. The main barn features 21 stalls, tack room, storage areas and automatic waterers, timer lights and fans in all stalls. Two arenas with 15,000 watt stadium lighting provide everything you need for training horses! Additional features include a round pen, three wash racks with hot water, irrigation and covered observation deck. An oversized bay boasts 6-bay parking with 6 additional stalls, 2 cattle loading chutes that accommodate semi and stock height trailers with unloading pen. Also featuring 12 turn-outs with sheds and 5 cattle pens with sheds, docturing pen with head chute. Plenty of room for RV's with 8 RV and camper hook ups and semi trailer for hay. Property is fully fenced and features an extra wide driveway with electronic gated entry. This property is currently set up to hold 100+ cattle! Less than 1 hour from airport and 2 hours to Disney! Convenient to stores, hospital, airport and beaches while enjoying the ranch life and true Florida living! Option to transfer current income business. Owners have poured their heart, soul and love into this majestic estate, now it's your turn to enjoy all this farm has to offer!